Exon V30 Drive them back! The Exon V30 is more than just a mouse. Latest generation optical sensor, rubber side grips, powerful software and RGB technology make this peripheral the essential weapon for any gamer, both casual and professional. The V30 follows in the footsteps of the Exon range: efficiency and speed in ergonomic and attractive designs. The Exon V30 features the latest technology, integrating a PixArt PMW 3325 Optical Sensor and an adjustable DPI OTF (On The Fly) of up to 5,000 DPIs and 100 IPS. Its design features include rubber side grips and a surface area of more than 30% slide-out that will allow you to achieve a level of control during gameplay that you've never experienced before. And with Omron Switches too? Perfection really does exist. Thanks to its intuitive and powerful software you can take full advantage of your RGB LED system featuring up to 16.8 million colors. The layer of customization of your mouse is as powerful as its motion technology. The Exon V30 is perfect for those gamers that have their own style and way of playing. The Exon V30 also boasts details such as gold plated USB, top-quality braided cable and an internal memory of 128 KB. The genius is in the details. 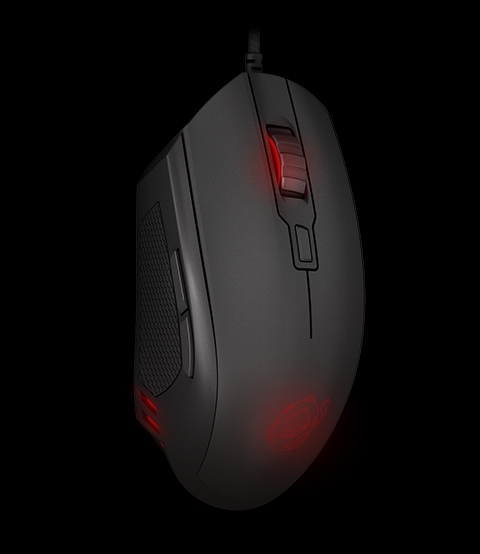 El ratón gaming Ozone Exon V30 combina a la perfección el excelente sensor óptico PixArt PMW3325 con una ergonomía realmente buena, por lo que podríamos considerarlo uno de los mejores ratones de su gama. La marca ha colocado uno de los mejores sensores ópticos de la actualidad, el cual se acompaña de un diseño muy cómodo a la hora de usarlo por largas sesiones. Ozone vuelve a proporcionar a los usuarios un ratón orientado a juegos de mucha calidad y a un precio contenido. Es un ratón de formas suaves y adecuado para manos de tipo medio/pequeñas por sus dimensiones. Es un ratón muy ligero, pues pesa tan sólo 110 gramos y construido con una gran calidad de materiales.